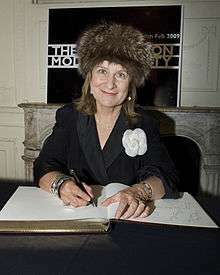 Helena Ann Kennedy, Baroness Kennedy of The Shaws, QC, FRSA (born 12 May 1950), is a British barrister, broadcaster, and Labour member of the House of Lords. Lady Kennedy of The Shaws, as she is properly styled, is a former chair of the Human Genetics Commission, which advises Her Majesty's Government on ethical, social, and legal issues arising from developments in genetic science. Lady Kennedy was born in Glasgow to a devoutly Roman Catholic family. She is one of four sisters born to Joshua Patrick and Mary Veronica (née Jones) Kennedy, both committed Labour activists. Her father, a printer with the Daily Record, was a trade union official. She attended Holyrood Secondary School in Glasgow, where she was appointed Head Girl. Kennedy still regularly attends Mass and professes that her Catholicism "remains very much part of who I am", even though she eschews its more traditional values. She went on to study Law at London's Council of Legal Education. Among her many cases, Kennedy acted as junior counsel for child murderer Myra Hindley during the latter's 1974 trial for plotting to escape from Holloway. Her first partner was the actor Iain Mitchell, with whom she lived from 1978 until 1984, and by whom she has a son. In 1986, Kennedy married Dr Iain Louis Hutchison (a surgeon), with whom she has a daughter and a son. Lady Kennedy rebels against her party whip in the House of Lords more frequently than any other Labour Peer, having a dissent rate of 33.3%. She was Chair of Charter 88 (1992–97) and is closely affiliated to the educational charity Common Purpose. As Commissioner of the National Commission for Education, she chaired a committee on widening participation in further education and the Commission's report, Learning Works, published in 1997. 1 2 3 4 Wroe, Nicholas (27 March 2004). "A radical in the House". The Guardian. Retrieved 2 March 2011. ↑ "One of Your Own: The Life and Death of Myra Hindley", by Carol Ann Lee (2012). ↑ "Baroness Helena Kennedy QC elected next Principal of Mansfield College", University of Oxford Mansfield College, 13 April 2011. ↑ Qureshi, Huma (17 October 2012). "Helena Kennedy: 'Women's struggles are not over'". The Guardian. London. Retrieved 6 May 2015. ↑ "Meet The Team", LIFT. Retrieved 9 August 2016. ↑ "SafeHands for Mothers". SafeHands for Mothers. Retrieved 9 September 2014. ↑ The London Gazette: no. 54934. p. 12205. 30 October 1997. Charity Commission. Helena Kennedy Foundation, registered charity no. 1074025.